Every word, thought, and action is energy. We are constantly processing these bits of energy so as to keep moving forward in a smooth fashion through our life. But so much happens in our daily life….it’s not possible to process all of that energy, clear it out and start with a clean slate everyday. Our true mission, our true work in life beyond what we do for a living, is to circulate love and good feeling, to ourself first. There are many ways of taking loving care of our self. One of my ways is to periodically retreat to the beach. Standing on the ocean’s edge, I give everything up I have been holding on to that is cluttering up my energy field. I have other ways of clearing my energy field and processing collected remnants of energy: every night when I get into bed, I do my Medical Qi Gong breathing, my self- Reiki, and I state my intention to release everything I may have collected during this day and before, and am now ready to surrender. Doing kidney breaths all during the day helps me empty bits and pieces of energy I may have taken on during the course of the day. And always, quiet times, meditation (however brief) contribute to my well-being and smooth flow. But my favorite spot is at the edge of the ocean. This is where my heart sings. I grew up on the Pacific Ocean beaches of Southern California. It was a good symbol for the first part of my life: wilder, unpredictable and less settled. 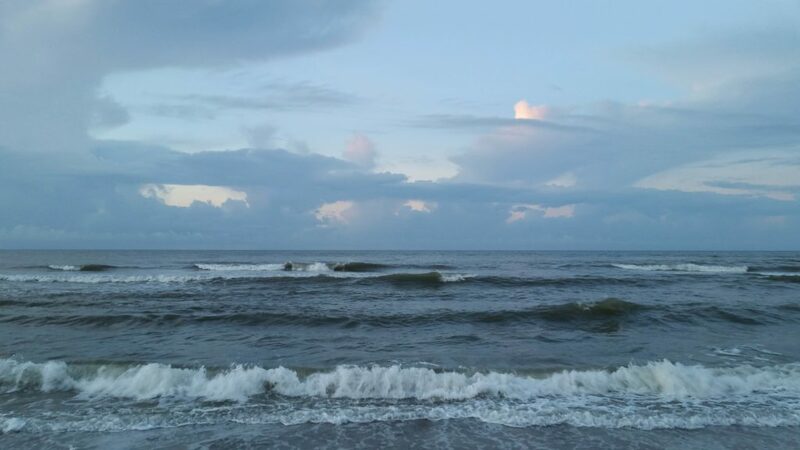 The Atlantic Ocean, while it can be fierce in times of storm and hurricane, has a softness and warmth, particularly in the summer, that the Pacific Ocean never has. Yes, the Atlantic can be treacherous with its rip currents, just like the cliffs and cold and rogue waves of the Pacific in Northern California can be. But at the same time both are magnificent and breathtaking….. and requiring respect and care, just like our beloved self. Sometimes as I release and I feel clearer and lighter, I feel completely empty, open to the present moment. And then my human mind crops up and says wait, what would happen if we were completely empty? What would happen to me, the me that I think is the true me? But that me is not my true self, the I Am….and then I catch the ego in one of its tricks and release again. The true self is Love. The true self, the I Am, is not the me/I/ego of the human self that is our necessary partner in this life…. that me is the ego that dies with the body. The true self is what lives on, our energy that transforms into that love and light. As a favorite person of mine says, there is no I in love. All the love flows from our Higher Self and infuses our human experience as much as we are able and willing to allow and receive it. The I/me/ego is only as loving as our alignment with our higher self. It’s an ongoing journey to take loving care of ourself. Emptying, releasing, surrendering, letting go into the good or god is one way of taking love and care of ourself. Sometimes that journey includes a trip to the ocean. The vast water and endless waves and innate wisdom can take all our detritus in and transform it into light and love. When I stand with my feet in the water, or on the beach with the wind blowing through me, I have an opportunity to empty all flotsam and jetsam that has stuck to my energy field. As I release, give up, surrender, I remember I am that clear glass of water that began this lifetime. For a while I remember that Heaven is right here on Earth.